After delivering an all-time-high 145 Dreamliner jets last year, Boeing Co. 787 plants in North Charleston and the Seattle area are expected to repeat their record-setting performance in 2019. That’s largely because of the production increase from 12 to 14 jets per month. Boeing won’t say exactly when the rate will tick up, if it hasn’t already, citing the “quiet period” prior to next week’s quarterly and year-end earnings report. But the company’s North Charleston campus started preparing for the boost in 2018 and planned to hire hundreds of people to support the higher rate. It’s not clear how many people now work at Boeing South Carolina because the aerospace firm hasn’t updated the annual labor report on its website. It’s likely Boeing CEO Dennis Muilenburg will address the ramp-up during his Jan. 30 teleconference with financial analysts. Sheth notes that many Boeing suppliers are already producing components at the higher rate. With more Dreamliners rolling out of the factory, Sheth said he expects Boeing will deliver 164 of the wide-body jets in 2019. That’s four shy of the 14-per-month rate, but “it is one thing to assemble the aircraft at 14 per month and another matter when delivering the product at that rate,” he said. 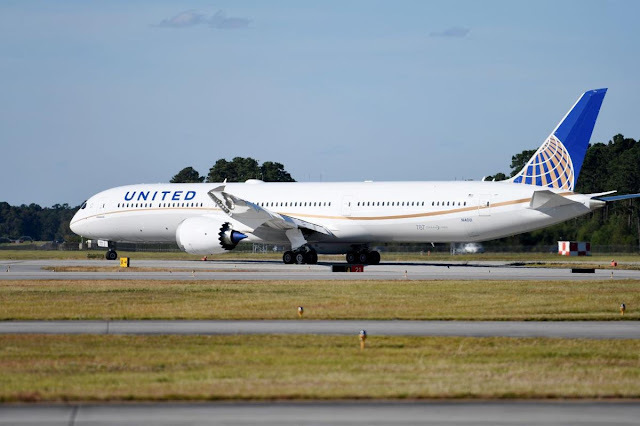 Boeing South Carolina will deliver a total of 85 Dreamliners: one 787-8, 50 787-9s and 34 787-10s, which are built exclusively at the North Charleston campus. Everett will deliver 79 Dreamliners: 9 787-8s and 70 787-9s. Sheth isn’t entirely convinced Boeing will be able to book enough new orders to keep cranking out 14 Dreamliners per month, a rate that would eat through the production backlog by September 2022. “I believe that if they get fewer than 144 net orders per year for the next two years, Boeing will be forced to reduce the production rate to 12 per month,” he said. On January 19, 2019, about 1315 central standard time, a Piper PA-28 airplane, N3298Z, owned by a private individual impacted a frozen lake near Iron Mountain, Michigan. The airline transport rated pilot received minor injuries. The airplane sustained substantial damaged. The airplane was owned and operated by the pilot as a Title 14 Code of Federal Regulations Part 91 personal flight. Day visual meteorological conditions prevailed and no flight plan was filed for the local flight that originated at Ford Airport (IMT), Iron Mountain, Michigan. According to the pilot's statement, he had an uneventful sight-seeing flight and intended to return to IMT. He initiated a left-hand turn about 800ft above ground level, over Fumee Lake, Michigan, and became distracted while focusing on a distant point across the frozen and snow covered lake. The pilot reported he lost reference to the horizon while continuing in a descending left turn and impacted the ground with the left wing, main gear and right wing. The pilot indicated on his accident report that there were no mechanical malfunctions with the airplane prior to the accident. At 1254, the IMT automated surface observation system, located 6 miles west of the accident site, reported the following weather conditions: winds 020º at 5 knots, 10 miles visibility, ceiling overcast 3,500 ft, temperature -11ºC, dew point -18ºC, and altimeter 30.19 inches of mercury. 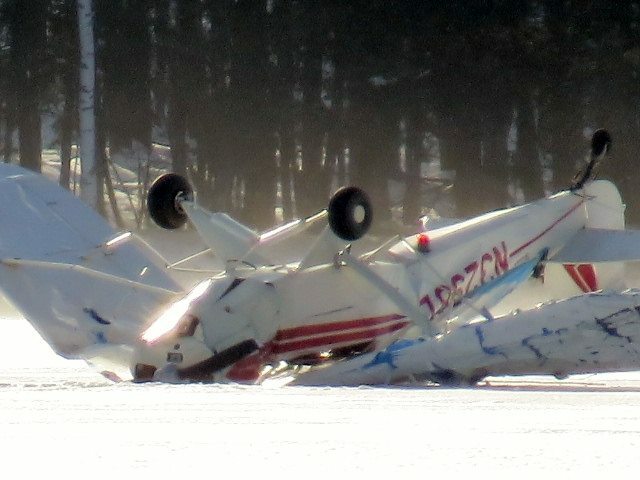 The Dickinson County Sheriff's Office 911 Dispatch received a 911 call, on 1-19-19 at 1:47pm, reporting that a Piper PA-18-90 Super Cub had crash landed on Big Fumee Lake in Breitung Township. 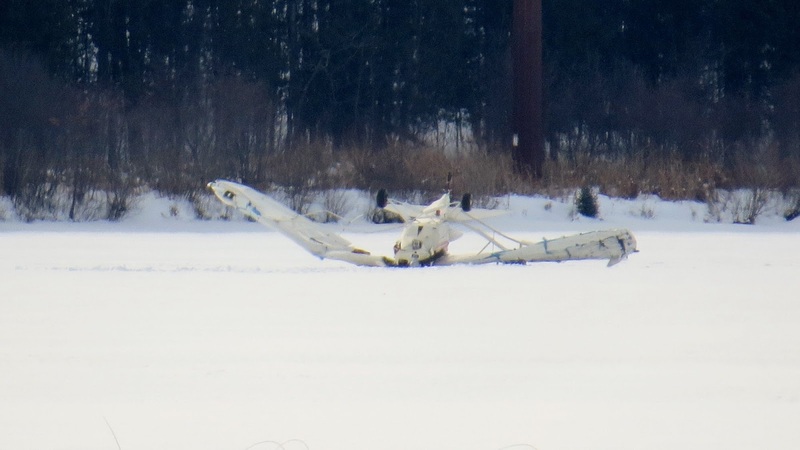 The caller advised that they had received a cellphone call from the pilot who was uninjured, walking out to Fumee Lakes Recreational Areas parking lot. The Dickinson County Sheriff's Office responded to the scene and made contact with the 62 year old male pilot. The pilot was transported out of the recreational area, by Norway Fires all terrain vehicle, to an ambulance for transport to the Dickinson County Memorial Hospital. The pilot was treated for minor injuries and released. The accident was reported to the Federal Aviation Administration for investigation. The plane currently remains on Big Fumee Lake. The Dickinson County Sheriff's Office requests that the public stay away from the crash site. The Dickinson County Sheriff's Office was assisted on scene by the Iron Mountain Police Department, Norway Police Department, Michigan State Police, Breitung Township Fire, Norway Fire and Integrity Care Ambulance. BREITUNG TOWNSHIP, Michigan -- A pilot escaped serious injury when his plane crashed in Dickinson County Saturday. 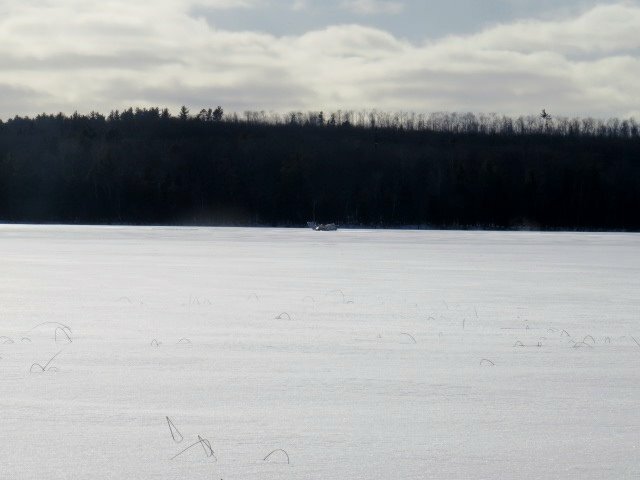 WLUC-TV says around 1:50 p.m. someone called 911 to report a Piper Super Cub had crash-landed on big Fumee Lake in Breitung Township. The caller said they were contacted by the pilot, who was walking to the lake’s parking lot. The Dickinson County Sheriff’s Office responded and met up with the 62-year-old pilot. He was taken out of the recreational area via ATV to an ambulance, which transported him to Dickinson County Healthcare System. The pilot was treated for minor injuries and released. The Federal Aviation Administration has been notified about the accident. The Sheriff’s Office is asking people to stay away from the crash site. 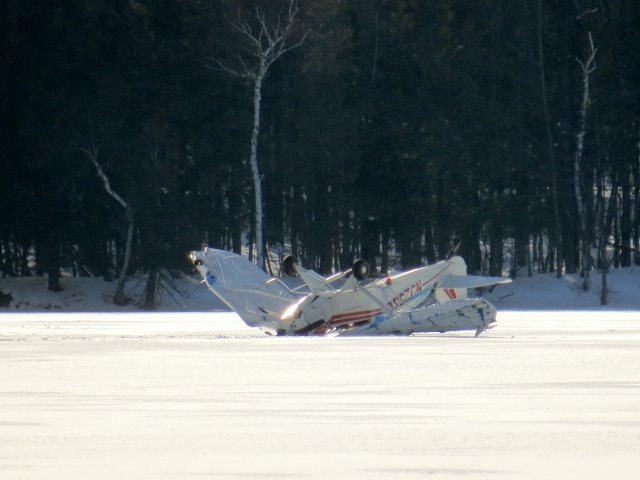 DICKINSON COUNTY, Michigan — A single-engine plane made what was called a “hard landing” on Fumee Lake near Upper Pine Creek Road. Rescuers from Norway Fire Department among others responded and were able to assist the pilot who was reported to be “up and talking” at the time. Both entrances to Fumee Lake were blocked during the rescue, but access has been cleared as of this report. FOX 17 was in contact with local resident, Jason Asselin, who was able to safely provide pictures and video of the wreckage. With the mild winter Michigan has experienced, the ice on the lake will be extremely dangerous after an impact such as this. It is not advisable for anyone to go out on the lake at this time. A small plane made an emergency landing Sunday afternoon on Kyle Canyon Road, according to Las Vegas police. The Metropolitan Police Department and Nevada Highway Patrol were called about 12:30 p.m. Sunday to Kyle Canyon Road, between mile markers 18 and 19, just west of U.S. Highway 95, according to Metropolitan Police Department Lt. Chris Holmes. 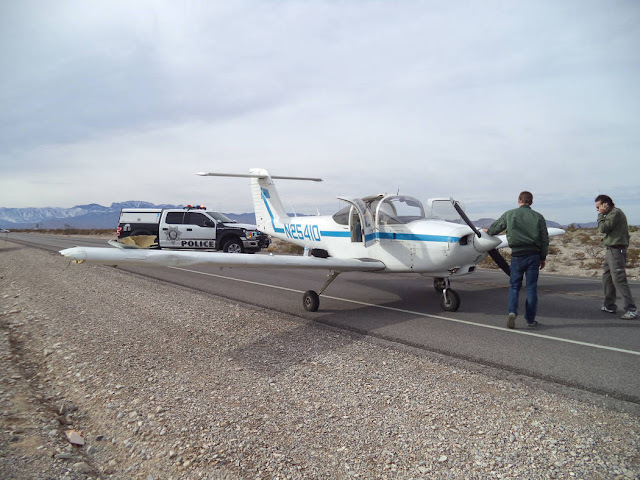 An instructor pilot and a student were flying a single-engine plane near Mount Charleston when the engine stalled, the Nevada Highway Patrol said in a release Sunday evening. Attempts to restart the engine failed, and the instructor landed the craft safely on the road. No one was injured, the release said. Kyle Canyon Road was closed in both directions for about two hours Sunday, according to police. Roads reopened just after 2:30 p.m. The plane was moved to the side of the road and would be disassembled and moved back to North Las Vegas Airport, the release said. The cause of the engine failure was unknown Sunday evening. 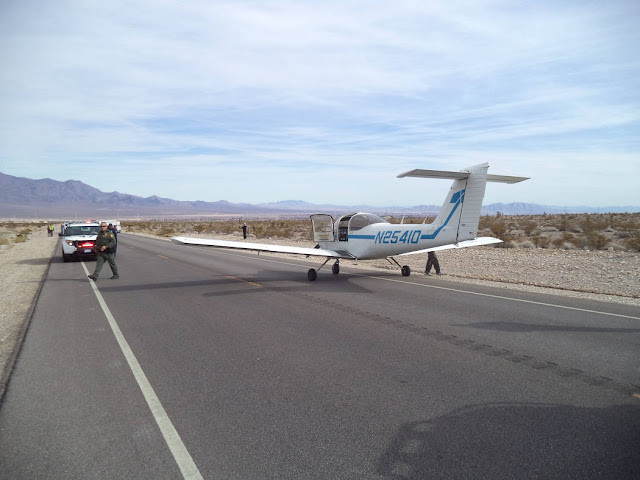 LAS VEGAS (FOX5) -- A small aircraft had to make an emergency landing on Kyle Canyon Road, heading towards Mount Charleston, on Sunday afternoon, according to Las Vegas Fire and Rescue. 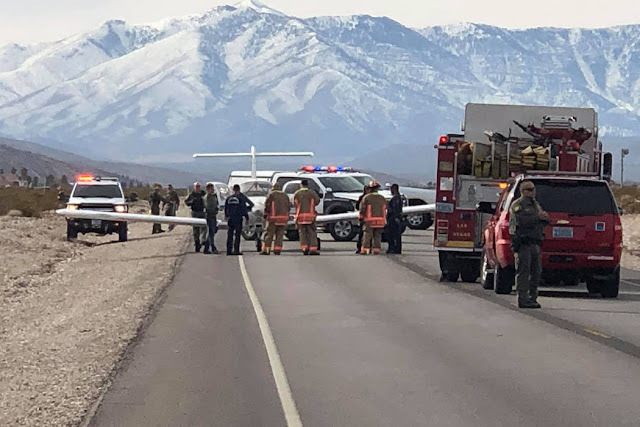 LVFR said the plane landed near mile marker 19 on Kyle Canyon Road at around 12:30 p.m. All occupants inside the plane were safely escorted out. No injuries were reported. Las Vegas Metropolitan police Lt. Chris Holmes said the pilot was experiencing engine failure before making the emergency landing. Nevada Highway Patrol closed the westbound lanes of U.S. Highway 95 at the frontage road and Kyle Canyon Road to traffic, according to Holmes. Kyle Canyon Road heading east and west was also closed. Traffic was being diverted to Lee Canyon Road, Holmes said. WAKEFIELD — A legal battle that could affect future operations at the Westerly State Airport was expected to be back in court this week, with a Superior Court judge hearing arguments on behalf of the Rhode Island Airport Corporation, which manages the facility, and four property owners who have been fighting the state agency since early 2016. A Washington County Superior Court judge is scheduled to conduct a hearing Tuesday in the case originally filed in March 2016 by property owners Hatsy Moore for the Harriet Chappell Moore Foundation; Jacqueline Abberton; the Rutter Family Revocable Trust; and Frances W. Kelly, trustee for the Frances W. Kelly Trust. Represented by East Greenwich lawyer Gregory Massad, the property owners assert that the state Department of Transportation, acting for RIAC, cited the wrong provision of the state's eminent domain law when it took avigation easements to clear trees on their property. They also assert that only the town, not the state transportation department, has the legal right to take avigation easements for removing airport hazards, including trees. Avigation refers to an easement related to the airspace above a property, and the right to operate aircraft and remove obstructions to their overflight. The plaintiffs are asserting, however, that RIAC's real purpose was economic development — to enhance or improve the airport's capabilities. The property owners also assert that by filing condemnation notices, the transportation department had engaged in "slander of title," interference with property rights, and trespass. The state agencies say they needed to take the easements to ensure that planes can fly safely as they approach and leave the airport. 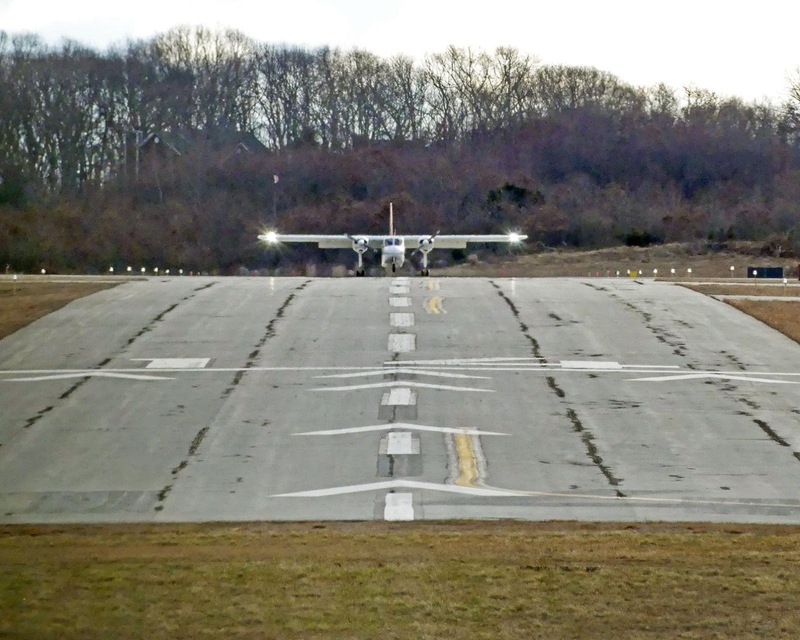 Two runways at the airport have been displaced, or effectively shortened, while RIAC awaits a final decision in the case and learns whether it can clear trees on the property owners' land. RIAC officials have said that in the future, additional trees in the area will also have to be cleared to comply with standards set by the Federal Aviation Administration. The plaintiffs say that the condemnation notices allow the airport corporation to enter their land at any time to remove trees, and to subject them to "noise, dust, vibrations, fumes," which amount to "a private nuisance"
Additionally, the property owners have argued that their right to due process was violated. "The defendant Rhode Island Department of Transportation, acting in concert with and for the benefit of the defendant, Rhode Island Airport Corporation, exceed the scope of its statutory authority ... in preparing, publishing and recording the notice of condemnation and avigation easements," Massad wrote in a memorandum opposing the state agencies' motion to dismiss the lawsuit. The case was largely dormant after Judge Luis M. Matos, in February 2017, granted an injunction preventing RIAC from clearing trees on the property owners' land until a trial could be conduced. But late last year RIAC representatives said they planned to resume their defense, and in November the transportation department and RIAC filed their dismissal motion. The motion to dismiss resurrects some of the same arguments that the defendants made to Matos before he issued the injunction. The DOT and RIAC assert that the property owners' only recourse is to dispute the amount of money the state offered them as part of the eminent domain process. If the "government increases its intrusion by flying substantially noisier planes within an existing easements or by flying at lower altitudes," the property owners could file a new petition for assessment damages, Harris K. Weiner, the lawyer representing the two state agencies, wrote in the motion to dismiss. Weiner also defended the eminent domain process used by the two state agencies. "Eminent domain has been a central governmental prerogative for centuries. It is crucial to effect many government purposes, especially safe public transportation," Weiner wrote. The motion to dismiss the case also disputes the property owners' claim of a private nuisance, slander of title, trespass, and alleged civil rights violations. President Donald J. Trump was present at Dover Air Force Base as four persons killed in an ISIS attack were returned to the United States. President Donald Trump was joined January 19th by Secretary of State Mike Pompeo and acting Secretary of Defense Patrick Shanahan as the remains of four Americans killed last week in Syria were returned to American soil. The bodies of Boynton Beach, Fla., native Chief Warrant Officer 2 Jonathan R. Farmer, 37, Chief Petty Officer Shannon Kent, 35, of New York state, Department of Defense contractor Scott A. Wirtz,42, of St. Louis, Mo., and defense contractor Ghadir Taher, 27, of East Point, Ga. were brought to Dover Air Force Base, Delaware. The four were numbered among 14 killed Jan. 16 when a bomb exploded in the Syrian town of Manjib. ISIS has claimed responsibility for the blast. The president had met with family members of each of the fallen beforehand at the passenger terminal and was to attend the transfer services for the others, walking out to the Globemaster each time with the rest of the official party. You don’t have to tell Brian Newton that an airport is important to a community. 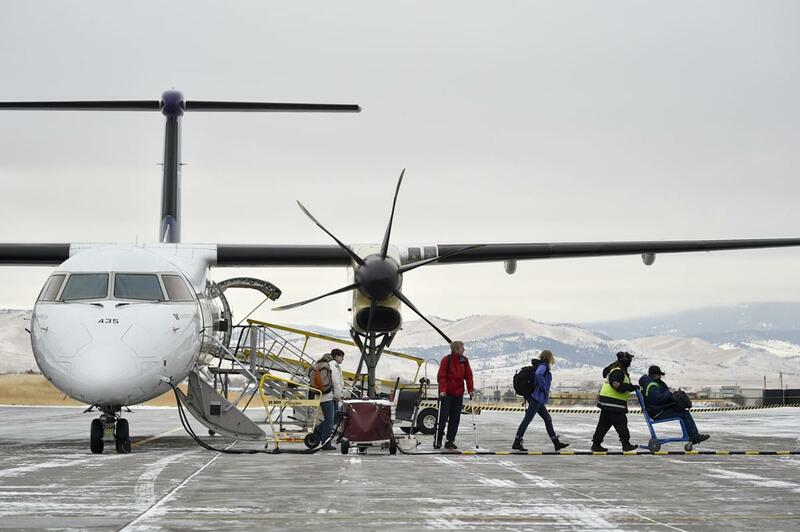 “Businesses might not locate or stay here without an airport,” Fremont’s city administrator said. And businesses mean jobs and money for the community. That’s one reason why plans are in the works to build a new terminal and aircraft parking apron and, hopefully, add more aircraft hangars at Fremont Municipal Airport, which is on the west side of town. A 2018 terminal area master plan for the airport lists a variety of plants, stores and offices that now use the facility. Those businesses include: HyVee Food Store; Costco; Walmart; Menards; Taylor & Martin; ADM; 3M; Fremont Beef; and Oil Gear. The airport’s importance to the community was outlined in a 2017 presentation to the Fremont City Council by Bob Crain, project manager of aviation services for Burns McDonnell in Kansas City, Missouri, made the presentation. • More than 50 aircraft are based at the airport. • Each year, the airport has 22,300 operations (aircraft take-offs or landings), according to statistics from FlightAware, a company that tracks pilots’ flight plans. • Of these operations, 12,200 are by local-area aircraft and 10,200 from visitors. The average stay for out-of-town aircraft is 6.5 hours. • Visitors — many of whom come to Fremont on business — come from coast to coast to the airport. Various businesses have aircraft at the airport. 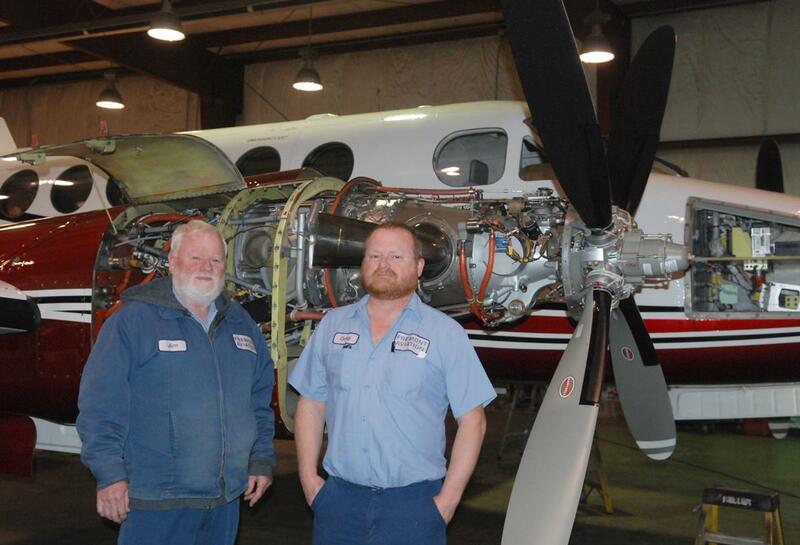 “We have numerous businesses that maintain aircraft out there and those aircraft are an essential part of their business operation,” Newton said. Newton cites Taylor & Martin, which conducts auctions of semi-trailer trucks and large equipment across the country. Costco poultry plant personnel uses the airport. “We see more, smaller jets landing at our airport, because of business conducted in Fremont than we ever have,” Newton said. Helicopters, including one used by a medical business, are kept at the airport. The helicopter used by Methodist Fremont Health lands and refuels at the airport. “They’re purchasing fuel and we’re getting sales tax and revenues from the fuel that would be going elsewhere if we didn’t have an airport,” Newton said. The airport, itself, provides jobs. Fremont Aviation began operation here in 1994 and provides maintenance, private pilot and instrument instruction and Christmas light rides. It employs two mechanics, a secretary, two instructors, a commercial pilot and three line personnel, states data provided by Jim Kjeldgaard, the fixed based operator. Newton also said they conduct annual inspections and repairs. The airport has other uses. Crop dusters come every summer and set up operations here, moving out again in the fall, Newton said. The Civil Air Patrol (CAP) leases an older building, listed on the National Register of Historic Places. Every summer, cadets from across the nation come here for training. In addition, the Rotary Fly-in Breakfast and July Fourth fireworks show are held here. The area of the airport is about 320 acres. Newton said the city owns the ground on which the airport sits. What’s not used for airport purposes is leased out for crop production. Newton said the city does snow removal, mowing and maintenance on buildings at the airport, along with administration and paperwork. The airport generates revenue from various sources. In 2017, the airport received $163,658 in revenue. Revenue sources were: hangar, pad rent and water: $83,850; rent of about 250 farm acres, $55,669; fee from FBO, $18,486; fuel flow fee, $5,005 and interest income, $648. In 2017, the airport’s expenditures exceeded revenue. Newton noted that the airport operated at a loss in 2017 with total expenditures at $186,120. Repairs and maintenance at the airport totaled $37,297. The airport had a gain in 2016, however, when it had $146,252 in revenues and $105,912 in expenditures. Preliminary figures from the city for 2018 also indicate the airport had a gain last year with $137,501 in revenue and $120,481 in expenditures. The airport, itself, has a decades-old history. In 1940, John Siems accepted the job of manager of the airport’s fixed base operator. 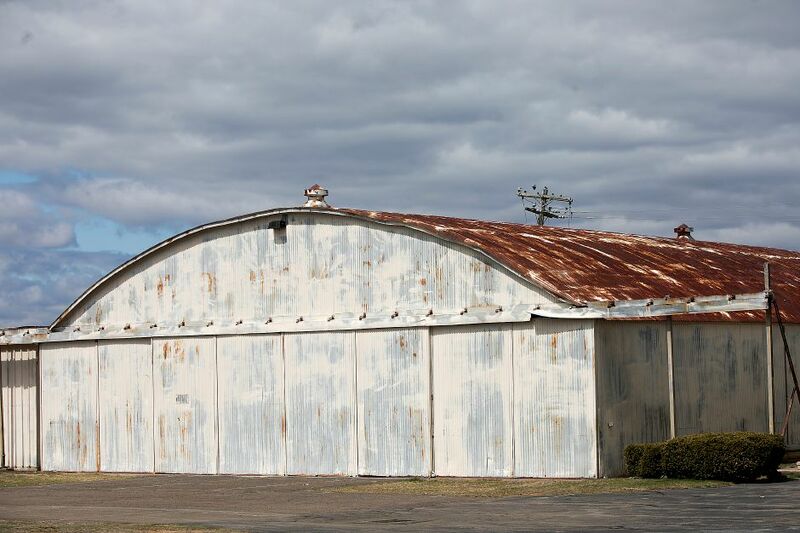 His and his father built a two-stall hangar on an 80-acre stubble field, where the present airport stands. Construction of a brick hangar started in 1941, states information provided via Fremont Aviation. Bricks for the hangar came from a Fremont schoolhouse that had been torn down. The hangar part of the building was once the office and shop area. The front of the hangar was built as apartments for pilots in training programs and now houses the CAP. Bulk hangars were added in the 1950s and 1960s. The addition of T-shaped hangars came in the 1980s and 1990s. The advantage of T-hangars is that more planes can be fit in a certain amount of space, because of the units’ shape. The airport also has some 50 by 50 foot and 50 by 60 foot hangars. In the airport’s early years, runways were grass strips. A runway and a taxiway were paved in 1947. 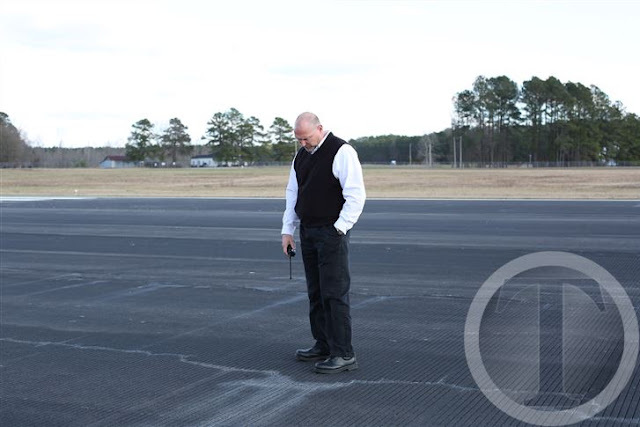 The runway was extended to 5,500 feet in 1995 to provide more safety and accommodate growing corporate traffic. In 2010, the runway was extended to 6,350 feet. 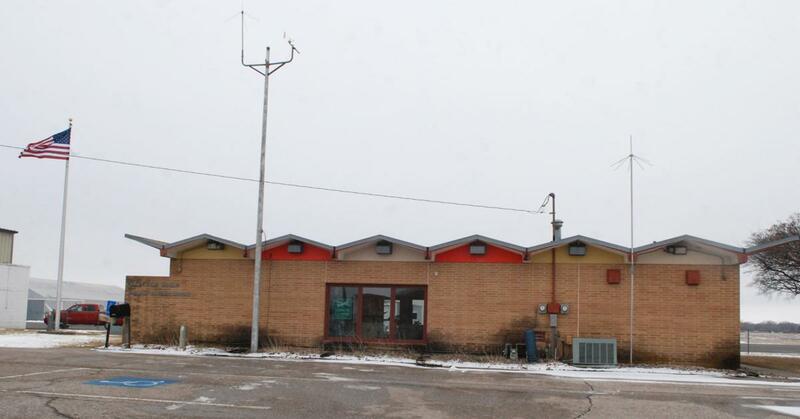 The current terminal was built in 1962, the Burns McDonnell report said. The facility needs new heating and air conditioning systems and other upgrades. It lacks Americans with Disabilities (ADA)-complaint access and amenities. The new terminal, set to be situated southwest of the current one, will be closer to the runway. That location would let staff in the terminal better monitor the runway and be able to see incoming planes, said Dave Goedeken, Fremont’s director of public works. The new terminal would be on the northeast side of the new parking apron. Newton said the current apron is worn out and needs to be expanded to accommodate more activity and larger planes. The new parking apron will encompass an area of approximately 6,000 square yards. The apron will fit up to 10 smaller or four larger aircraft. Plans are to extend Taxiway B to connect the existing terminal area. Newton said there currently are no plans to expand the airport other than the terminal and apron. 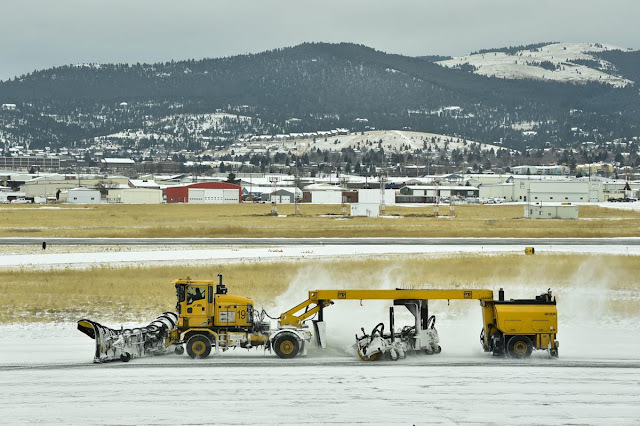 The existing runway will stay the same length in the foreseeable future, but at some point, a parallel concrete taxiway will be extended, Goedeken said. Future plans include adding and centrally locating aircraft hangars in the new terminal/apron area. Newton said there is a demand for more hangars and during an Airport Advisory Committee meeting in December, Kjeldgaard confirmed that all the hangars at the airport are full. “We’re constantly getting people asking if we’ve got any hangars,” Kjeldgaard said. During the meeting, Eric Johnson, a committee member, talked about the Revolving Hangar Loan Program. This is an interest-free loan from the Nebraska Department of Transportation’s Division of Aeronautics. Johnson said the city would apply for the funds. The state’s aeronautics commission, which meets quarterly, would review the application and make an award based on available funds. Johnson added that federal money couldn’t be used for the hangars, because all those funds are going toward the apron and terminal. Newton stressed the advantages of being able to get federal dollars for projects. Anna Lannin explained how the federal funding works. Lannin is planning and programming division manager of the Nebraska Department of Transportation, Division of Aeronautics. Lannin said Fremont is licensed by the state as to operate as a public use facility and is classified as a regional airport. “We are planning to update the system plan soon and the airport categories will be reviewed and redefined at that time,” Lannin said. She did note that it’s difficult for a regional airport, which not only supports its local community but the regional community around it. It’s also not easy because of competition from larger airports and the economics of flying an airplane. There are 80 public use airports, 21 of which were classified in 2002 as regional airports. 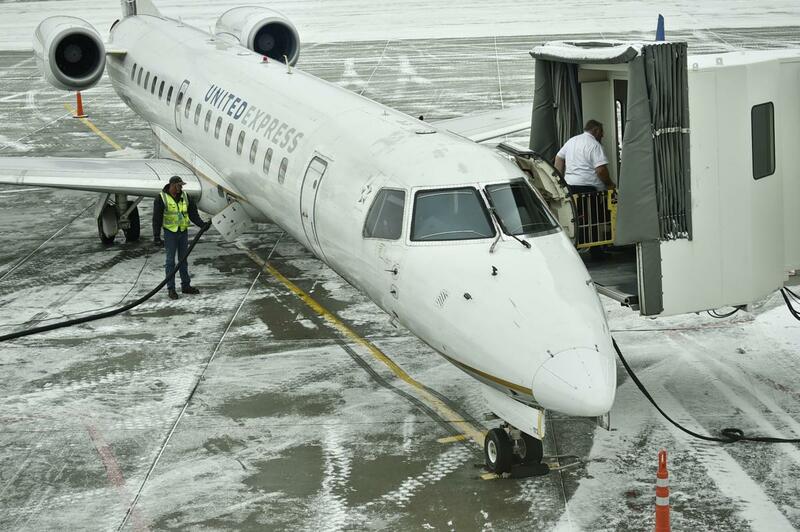 “In Nebraska, there are 73 airports eligible to receive federal funding and most have received and Airport Improvement Program (AIP) grant,” Lannin said. Federal funds are received by the state and dispersed to the airport sponsors to reimburse them for eligible expenses for projects with the AIP grant. Work continues to make airport improvements and those involved hope plans will take off soon. Missing was Gerson Salmon-Negron, 23, of Queens, New York. About 2 months later, on April 11, 2016, his body was discovered on a beach in Setauket Harbor, New York. 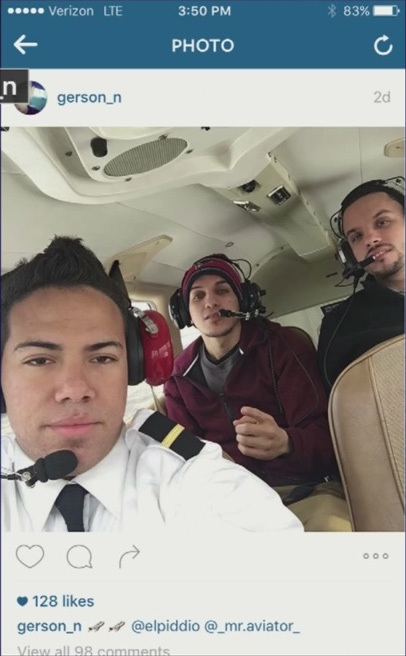 The student pilot, Austrico Ramirez, 25, of the Bronx; his flight instructor, Nelson Gomez, 36, of Queens; and Salmon-Negron’s friend Wady Perez, 25, of Queens were rescued by Suffolk police officers, taken to Stony Brook University Hospital, treated and released. An Instagram picture believed to be taken shortly before the plane went down. The student pilot and flight instructor were conducting an instructional cross-country flight with two passengers on board. They were returning to their home airport at night; the flight instructor estimated that there was a headwind of 30-40 knots and the airplane's groundspeed was about 81 knots during the cruise portion of the flight. Just before crossing a large ocean inlet, the flight instructor suggested that they divert for fuel on the other side of the inlet. Shortly thereafter, the engine "sputtered." The flight instructor then turned on the electric fuel pump and instructed the student pilot to switch the fuel selector to the left fuel tank and to maintain 2,000 ft msl. Once the fuel selector had been selected to the left fuel tank, the engine stopped sputtering. 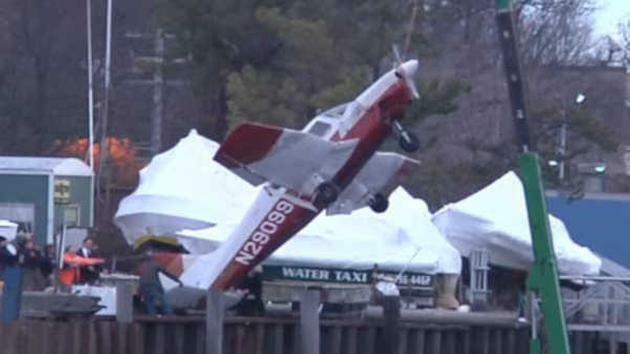 The flight instructor informed air traffic control that he wanted to divert to a nearby airport. They continued to fly for another 2-3 minutes when the engine sputtered again and lost total power. The instructor then took control of the airplane from the student pilot and advised the tower controller at the diversion airport that he was declaring an emergency. The flight instructor then made a 180° turn and headed for the shoreline. As the airplane descended, he was unable to see the shoreline due to the darkness and decided to ditch the airplane as close as he could to the beach. Upon touching down, the flight instructor opened the cabin door and instructed everyone to exit the airplane. The student pilot handed the instructor a life vest. The two passengers jumped into the water and started swimming for shore. Neither the student pilot nor the passengers were wearing life vests. About 3 minutes after the ditching, the airplane was located by a helicopter. The flight instructor, student, and one passenger were rescued. A search by the police department and the US Coast Guard could not locate the remaining passenger. About 2 months later, the missing passenger's body was discovered on a beach. The autopsy listed the cause of death as drowning. Postaccident examination of the wreckage revealed no evidence of any preimpact failure or malfunction of the engine or airplane that would have precluded normal operation. Examination of the fuel system revealed that the system was essentially devoid of fuel. The flight instructor estimated that 40 gallons of fuel were onboard before departure on the first leg of the flight; the student estimated 36 gallons were onboard. Before they departed from their home airport, the student pilot asked the flight instructor if he wanted to refuel, and the flight instructor advised him that they had plenty of fuel. The student again asked about refueling during the return flight, but the instructor stated the fuel looked good. There was no evidence that the flight instructor had obtained an official weather briefing before the initial or return leg of the flight. On the first leg of the flight, the instructor recognized that the winds aloft increased their groundspeed, allowing them to arrive at their destination sooner, but on the second leg of the flight, those same winds significantly increased their flying time. The instructor should have accounted for the effect of wind on the flight's duration. Review of the POH indicated that, at a 65% power setting, with full fuel tanks (48 gallons usable), endurance would be about 5.3 hours, and at a 65% power setting, with 40 gallons of fuel, endurance would be about 4.4 hours. Examination of aircraft rental and fueling records revealed that the airplane had been operated for 5.1 hours since it was last refueled. Thus it is likely that the flight instructor did not conduct adequate preflight fuel planning; had they done so and had they accounted for the wind, they would have recognized there was insufficient fuel to complete the flight and maintain the required 45 minutes of reserve fuel. The flight instructor's inadequate preflight fuel planning, which resulted in a total loss of engine power due to fuel exhaustion. 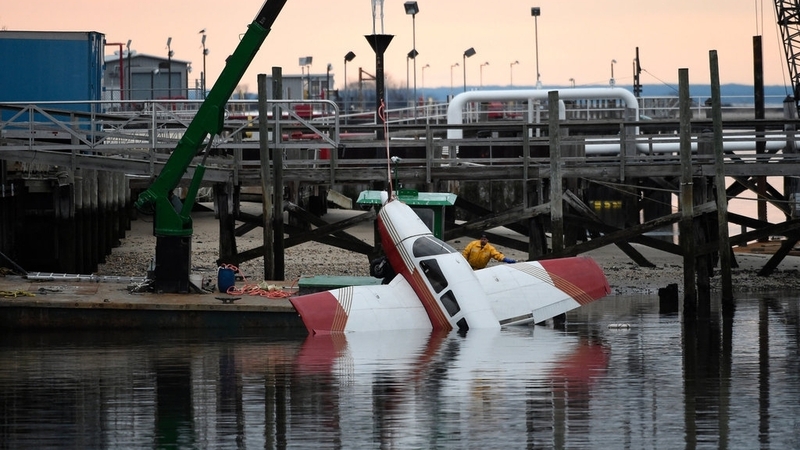 On February 20, 2016, at 2305 eastern standard time, a Piper PA-28-181, N29099, was substantially damaged during a ditching in Setauket Harbor about 1.5 nautical miles northwest of Port Jefferson, New York. The flight instructor, student, and one passenger received minor injuries, and one passenger was fatally injured. The airplane was owned and operated by Positive Rate Gear Up, LLC, as a Title 14 Code of Federal Regulations (CFR) Part 91 instructional flight. Night visual meteorological conditions prevailed, and no flight plan was filed. The flight departed Fitchburg Municipal Airport (FIT), Fitchburg, Massachusetts, about 2040 and was destined for Republic Airport (FRG), Farmingdale, New York. According to the flight instructor, the first leg of the instructional flight departed FRG about 1430; he believed that about 40 gallons of fuel was onboard before departing from FRG. According to the student pilot, the pilot of the previous flight told him that the left-wing fuel tank was full, and the right-wing fuel tank was half full (about 36 gallons total). The student stated that he asked the flight instructor if he wanted to refuel, and the flight instructor advised him that they had plenty of fuel. After takeoff from FRG, they flew to FIT at 2,000 to 2,500 feet above mean sea level (msl). The airplane encountered a strong tailwind and arrived in about 45 minutes. They spent some time in the Fitchburg area, then returned to FIT for the return flight. After takeoff, they departed the airport traffic area to the southwest on a direct heading for FRG and climbed to 4,500 ft msl because of turbulence at lower levels. The flight instructor estimated that the airplane had a headwind of 30-40 knots, and the airplane's groundspeed was about 81 knots during the cruise portion of the flight. He stated that there was no indication of any malfunction of the airplane. During this time, the student pilot asked the flight instructor about the fuel quantity, stating "does the fuel look good to you?" The flight instructor replied "yes." Just before passing Bridgeport, Connecticut, the flight instructor advised the student pilot that they should change their destination to Long Island MacArthur Airport (ISP) to refuel. As the airplane passed over the Igor I. Sikorsky Memorial Airport, Bridgeport, Connecticut, they turned the airplane southbound, started a slow descent, and crossed Long Island Sound. 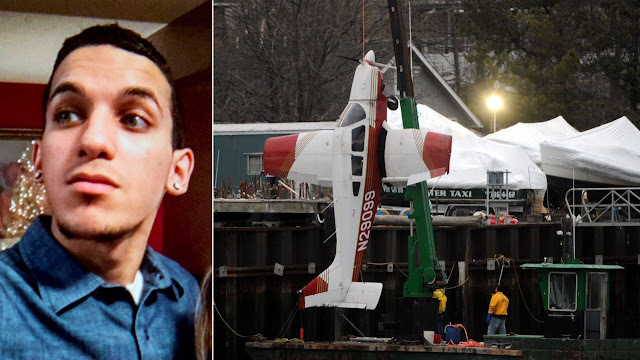 Upon reaching the area of Port Jefferson, New York, they leveled the airplane about 2,000 ft msl; the engine then "sputtered." The flight instructor immediately turned on the electric fuel pump and instructed the student to switch the fuel selector to the left fuel tank. Once the fuel selector had been selected to the left fuel tank, the engine stopped sputtering. The flight instructor informed air traffic control that he wanted to divert ISP, which, at the time, was 10 nautical miles south of their location. About 2-3 minutes later, the engine sputtered again and then lost power. The instructor then took control of the airplane from the student pilot and advised the tower controller at ISP that he was declaring an emergency and was going to attempt to land on the north shore of Long Island. The tower controller immediately notified emergency responders. A Suffolk County Police Department (SCPD) helicopter was airborne at the time and immediately proceeded toward the last known location of airplane. The instructor then made a 180° turn to the right and headed for the shoreline since he believed this was the most suitable place for landing and knew from experience that the area along the shore was normally clear of obstacles and houses. As the airplane descended, the instructor was unable to see the shoreline due to the darkness and decided to ditch the airplane as close as he could to the shoreline, judging his distance from the shore by using the lights from the houses. He then held the airplane off the water for as long as possible to keep from touching down on the water with excessive airspeed and risk nosing over (the airplane was equipped with fixed landing gear). Upon touchdown, the flight instructor opened the cabin door and instructed everyone to exit the airplane, grab the life vest that was in the baggage compartment of the airplane, and hold on to him. The student pilot then handed the instructor the life vest. One of the passengers then jumped into the water and started swimming for shore. The second passenger also jumped into the water. The student pilot was the last to egress from the airplane. Neither the student pilot nor the passengers were wearing life vests. About 3 minutes later, the airplane was located by the SCPD helicopter. Patrol officers from SCPD also responded to the shoreline and, after locating several kayaks behind a residence, made their way onto the water. They heard screams for help, paddled out toward the spotlight from the helicopter, rescued one of the passengers, and then, with the assistance of an SCPD marine patrol boat, the flight instructor. The student pilot was rescued by a patrol officer who entered the water on foot and threw a life ring to him and then pulled him to shore. A search by SCPD and the US Coast Guard for the missing passenger was conducted but he was not found. About 2 months later, on April 11, 2016, his body was discovered on a beach in Setauket Harbor, New York. The flight instructor held a commercial pilot certificate with ratings for airplane single- and multi-engine land, and instrument airplane. He also held a flight instructor certificate with ratings for airplane single-engine and instrument airplane. His most recent Federal Aviation Administration (FAA) first-class medical certificate was issued November 12, 2015. He reported 2,800 total hours of flight experience, of which 1,400 hours were in the accident airplane make and model. The student pilot reported that he had accrued 20 total hours of flight experience, 19 of which were in the accident airplane make and model. The accident airplane was a four-seat, low-wing monoplane of conventional metal construction. It was equipped with fixed tricycle-type landing gear and was powered by a four-cylinder, direct-drive, horizontally opposed engine rated at 180 horsepower at 2700 rpm. The basic airframe, except for a tubular steel engine mount, steel landing gear struts, and other miscellaneous steel parts, was of aluminum alloy construction. The wing tips, engine cowling, and tail surfaces were of fiberglass or ABS thermoplastic. According to FAA and maintenance records, the airplane was manufactured in 1979. 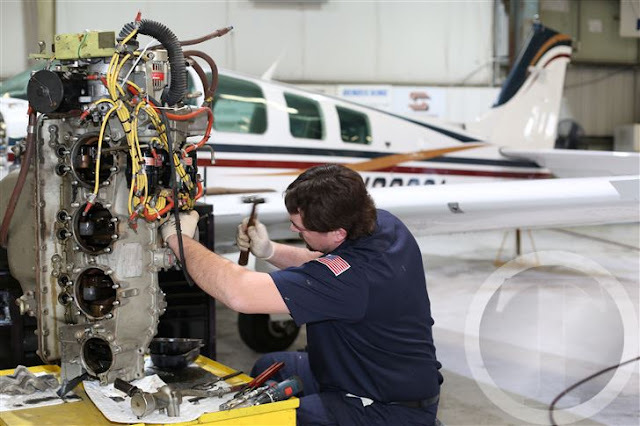 The airplane's most recent 100-hour inspection was completed on January 12, 2016, at 5,091 total hours. At the time of the accident, the airplane had accumulated 5,173.97 total hours of flight time. The airplane's fuel was stored in two 25-gallon tanks (24-gallons usable). According to the Piper PA-28-181 Pilot's Operating Handbook (POH), during the preflight inspection, the fuel quantity gauges were to be checked, the fuel tank sumps and fuel strainer were to be drained, and the fuel quantity was to be visually checked by opening the fuel tank caps and looking inside each of the fuel tanks. An aftermarket checklist was found in the airplane. 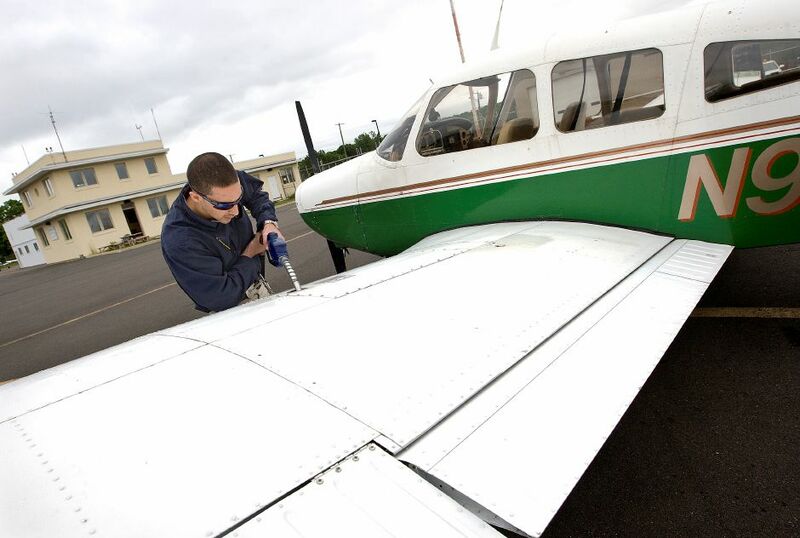 Although the checklist was not specified for use in a Piper PA-28-181, it was similar to the published POH's preflight inspection regarding fuel. - At a power setting of 75%, the engine would consume fuel at a rate of 10.5 gallons per hour (gph). - At a power setting of 65%, the engine would consume fuel at a rate of 9.0 gph. - At a power setting of 55%, the engine would consume fuel at a rate of 7.8 gph. At a 65% power setting, with full fuel tanks, endurance would be about 5.3 hours, and at a 65% power setting, with 40 gallons of fuel, endurance would be about 4.4 hours. Examination of aircraft rental and fueling records revealed that the airplane had been operated for 5.1 hours since it was last refueled. When asked if they had leaned the mixture during the flight, the student pilot advised that he had only seen the flight instructor lean the mixture during taxi on the ground at FRG and FIT. About 9 minutes before the accident (2256), the recorded weather at ISP, which was 11 miles from the accident site, included: wind 220° at 10 knots, 10 miles visibility, sky clear, temperature 7°C, dew point 3°C, and an altimeter setting of 29.82 inches of mercury. The National Weather Service (NWS) Surface Analysis Chart for 2200 EST depicted surface winds from the south-southwest at 10 to 20 knots, with no significant weather reported in the vicinity of the accident site. The Upton (OKX) Long Island 1900 sounding depicted a surface-based temperature inversion with a top near 2,000 feet. As a result of light surface winds and an increasing wind component with altitude, a moderate risk of low-level wind shear existed in the lowest 1,000 ft, and predominately light-to-moderate turbulence was predicted below 3,000 ft, and light turbulence through 10,000 ft.
An airplane descending into Providence, Rhode Island, at 2344 provided an in-situ measurement of the low-level winds. The airplane's track into the airport was from the southwest, parallel to Long Island Sound, and along the accident airplane's general route of flight. The airplane detected a surface-based temperature inversion to about 2,500 ft with westerly winds of 58 knots at that level. Another limited report from an airplane descending into LaGuardia reported a low-level wind maximum of 52 knots at 1,800 feet. According to the United States Naval Observatory, sunset occurred at 1732 and the end of civil twilight occurred at 1800. At the time of the accident, the moon was located at an azimuth of 187° and an altitude of 62° above the horizon, and the phase of the moon a waxing gibbous with 97% of the visible disk illuminated. A query to Lockheed Martin Flight Services (LMFS) found that there was no record that the pilot or instructor obtained a weather briefing either through the Direct User Access Terminal Service or LMFS. After the ditching, the airplane remained afloat for about 5 minutes before it sank nose first to the bottom of the bay and came to rest on its landing gear, about 100 ft northwest of Buoy S8. Charted water depth in the area was between 1 ft and 3.5 ft; however, the airplane ditched just after high tide so an additional 5 ft of water was present. Only 1 ft of the vertical stabilizer was visible above the water's surface after the airplane sank. Examination of the airplane after recovery revealed substantial damage due to salt water immersion, a broken engine mount, damage to the right wing inboard leading edge, damage to the bottom of the inboard right wing, and damage to the aft fuselage structure just forward of the stabilator. The pitot tube was clear, and the stall vane moved freely. Flight control continuity was established from the flight controls in the cockpit to the ailerons, stabilator, and rudder. The stabilator trim was neutral. The wing flaps were in the fully extended (40°) position. Both wing flaps exhibited impact damage, and the right wing flap actuating linkage was fractured. Visual examination of the fuel tanks through the filler ports revealed that only a small amount of liquid with the odor of seawater was visible in the fuel tanks. About 4 gallons of a semi-opaque liquid was drained from both fuel tanks. When the liquid was tested with water-finding paste, the paste turned pink indicating the presence of water. The outlet screens from each tank were free of blockages. The throttle was full forward, the mixture was full rich, the carburetor heat control was in the "OFF" position, and the primer was in and locked. The fuel selector was in the left fuel tank position. The master switch, fuel pump switch, landing light switch, navigation lights switch, anti-collision lights switch, and radio master switch were all in the "ON" position. All the seats were in place and secure, and the seatbelts were in place, unbuckled, and secure at their attachment points. Both front shoulder straps were hanging loose and were not attached to the lap belts. The propeller was a one-piece alloy forging and remained attached to the front of the engine crankshaft; it displayed light leading-edge erosion and no evidence of S-bending. Drive train continuity was established from the front to the back of the engine, and thumb compression was present on all four cylinders. Internal examination of the cylinders using a borescope did not reveal any anomalies of the cylinders, piston heads, or valves. Both magnetos were found secure to their respective mounts. The magnetos were removed and disassembled. Internal examination of the magnetos revealed no evidence of any preimpact anomalies; corrosion consistent with salt water immersion was present on the internal case and gear region. The spark plugs and ignition harness were removed and examined. The massive electrode plugs indicated a worn-out service life. The fine wire plugs indicated a normal service life when compared to the Champion Aviation Check-A-Plug Card (AV-27). The ignition harness exhibited some damage to the outer overbraid near the magneto caps and near the spark plug leads. The starter, alternator, and vacuum pump remained attached to their mounting locations. The engine oil system was intact. The engine contained oil in the galleries and rocker box covers. The oil suction screen was removed and a liquid consistent with diesel fuel (which had been added after recovery to help stop corrosion due to the salt water), oil, and salt water drained from the oil sump. 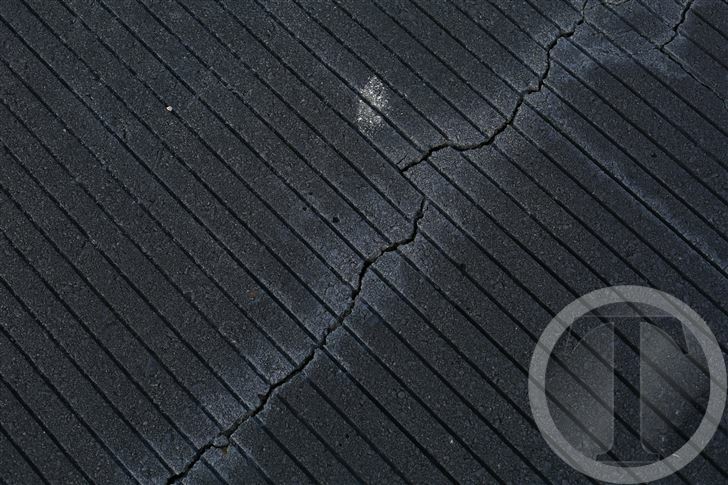 The oil suction screen contained a piece of material that was consistent with a disposable paper rag. It was lodged within the suction screen and covered about 25% of the length of the screen. The oil filter was removed and drained, and no metal was found. The oil cooler was impact-broken from its mount; however, it had not been breached and all attached hoses remained secure to the inlet and outlet ports of the oil cooler. The engine's fuel system remained intact. The fuel strainer was devoid of fuel. The carburetor was found secure on its mount. The carburetor float bowl was drained through the drain plug into a container, and the liquid was primarily water with a faint odor consistent with 100LL aviation fuel. The engine-driven diaphragm pump provided suction and compression at the inlet and outlet ports of the pump. The Suffolk County Office of the Medical Examiner, Suffolk County, New York, performed an autopsy and toxicological testing of the deceased passenger. The autopsy listed the cause of death as drowning; the toxicological specimens were negative for any drugs of abuse. Positive Rate Gear Up, LLC, was a flying club based at FRG. The club's primary goal was to provide its members with basic general aviation airplanes. The club's airplanes were available for both training and leisure purposes. The fleet consisted of several Piper PA-28 models, a PA-34-200, and two Cessna 172s. The club offered discovery flights, primary flight training, and advanced flight training, including private pilot, instrument pilot, commercial pilot, flight instructor, instrument ratings, and multi-engine ratings. According to 14 CFR 91.151, no person may begin a flight in an airplane under VFR conditions unless (considering wind and forecast weather conditions) there is enough fuel to fly to the first point of intended landing and, assuming normal cruising speed, to fly an additional 30 minutes during the day and an additional 45 minutes at night. Injuries: 1 Fatal, 3 Minor. On February 20, 2016, at 2305 eastern standard time, a Piper PA-28-181; N29099, owned and operated by Positive Rate Gear Up LLC, was substantially damaged during a ditching in the Setauket Harbor about 1.5 nautical miles northwest of Port Jefferson, New York. The flight instructor, student, and one passenger, received minor injuries, and one passenger is missing and presumed to be fatally injured. Night visual meteorological conditions prevailed and no flight plan was filed for the instructional flight conducted under Title 14 Code of Federal Regulations Part 91, which departed from the Fitchburg Municipal Airport (FIT), Fitchburg, Massachusetts, destined for Republic Airport (FRG), Farmingdale, New York. According to the flight instructor, this was the second leg of an instructional flight that had departed FRG about 1430 for FIT. 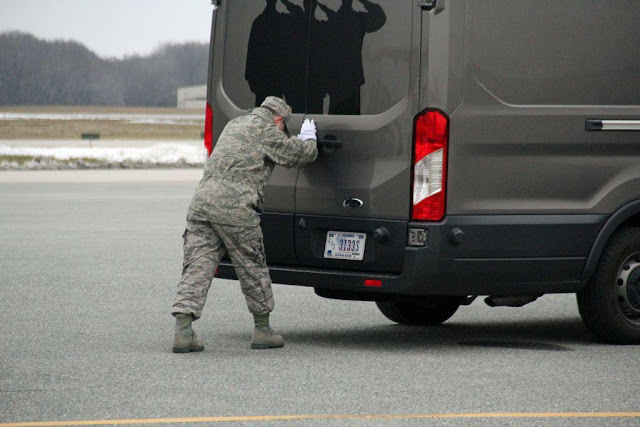 After spending some time in the Fitchburg area at a university, a restaurant, and a local Walmart, they returned to the airport and departed at approximately 2040 for FRG. After takeoff, they departed the airport traffic area to the southwest and climbed to 4,500 feet above mean sea level (msl) on a direct heading for FRG. The flight instructor estimated that he had a headwind of 30-40 knots, and his groundspeed was approximately 81 knots during the cruise portion of the flight. He stated that there was no indication of any malfunction of the airplane. As the airplane passed over the Igor I. Sikorsky Memorial Airport (BDR), Bridgeport, Connecticut, they turned southbound and crossed Long Island Sound at that point as there was less water to fly over in this location. They started a slow descent also as they passed over BDR, and upon reaching the area of Port Jefferson, New York, leveled off around 2,000 feet msl. the engine then "sputtered." The flight instructor immediately turned on the electric fuel pump and instructed his student to switch the fuel selector to the left fuel tank and to maintain 2,000 feet msl. Once the fuel selector had been selected to the left fuel tank, the engine stopped sputtering. The pilot informed air traffic control that he they wanted to divert to ISP, which at the time was only 10 nautical miles south of them. They continued to fly for another 2-3 minutes when the engine sputtered again and then lost power. He then took control of the airplane from the student pilot and advised the tower controller at ISP that he was declaring an emergency. The flight instructor then made a 180 degree turn to the right, and headed for the shoreline since he believed this was the best suitable place for landing, and knew from experience that the area along the shore was normally clear of obstacles and houses. As they descended, he was unable to see the shoreline due to the darkness and decided to ditch the airplane as close as he could to the shoreline, judging his distance from the shore by using the lights from the houses. He then held the airplane off the water for as long as possible to keep from touching down on the water with excessive airspeed and risk nosing over as the airplane was equipped with fixed landing gear. Upon touching down, the flight instructor opened the cabin door and instructed everyone to exit the airplane, and to grab the life vest that was located in the baggage compartment of the airplane and to hold on to him. The student pilot then handed him the life vest. One of the passengers then jumped into the water and started swimming for shore. The second passenger then also jumped into the water. The student pilot was the last to egress from the airplane. Neither the student pilot nor the passengers were wearing life vests. After the pilot reported the engine failure to ISP and that they were going to attempt to land on the north shore of Long Island, the tower controller immediately notified emergency responders. A Suffolk County Police Department (SCPD) Helicopter was airborne at the time, and was provided with radar vectors, and immediately proceeded toward the last known location of airplane. Approximately 3 minutes later, the airplane was located by the SCPD helicopter. Patrol Officers from SCPD also responded to the shoreline and after locating several kayaks behind a residence, made their way onto the water and after hearing screams for help, paddled out towards the spotlight from the helicopter, rescued one of the passengers, and then with the assistance of an SCPD Marine Patrol boat, the flight instructor. The student pilot was also rescued by a Patrol Officer who entered the water on foot and threw a life ring to him and then pulled him to shore. A search by SCPD, and the United States Coast Guard for the missing passenger was also initiated, and at the time of this preliminary report, the missing passenger has not been located. After the ditching, the airplane remained afloat for about 5 minutes before it sank nose first to the bottom of the bay, and came to rest on its landing gear, about 100 feet northwest of Buoy S8. Charted water depth in the area was between 1 and 3.5 feet however, the airplane ditched just after high tide so there was an additional 5 feet of water. Only 1 foot of the vertical stabilizer was visible above the water's surface at the time. Examination of the airplane after recovery revealed that, it was substantially damaged due to salt water immersion, a broken engine mount, and damage to the aft fuselage structure just forward of the stabilator. Flight control continuity was able to be established from the flight controls in the cockpit to the ailerons, stabilator, and rudder. The stabilator trim was neutral. The wing flaps were in the fully extended (40-degree) position. Both wing flaps also exhibited impact damage, and the right wing flap's actuating linkage was fractured. The throttle was full forward, the mixture was full rich, the carburetor heat control was in the "OFF" position, and the primer was in and locked. The fuel selector was in the left fuel tank position. Examination of the engine revealed that, it contained oil in the galleries and rocker box covers. Drive train continuity was also able to be established, and thumb compression was present for all four cylinders. Internal examination of the cylinders also did not reveal any anomalies of the cylinders, piston heads, or valves. Internal examination of the magnetos also did not reveal any preimpact anomalies. Examination of the fuel system did not reveal evidence of fuel in either the left or right fuel tanks, nor in the fuel strainer, or carburetor float bowl. Examination of aircraft rental and fueling records also revealed that the airplane had been operated for 5.1 hours since it was last refueled. The flight instructor held a commercial pilot certificate with ratings for airplane single-engine land, airplane multi-engine land, and instrument airplane. He also held a flight instructor certificate with ratings for airplane single-engine, and instrument airplane. His most recent Federal Aviation Administration (FAA) first-class medical certificate was issued November 12, 2015. He reported 2,800 total hours of flight time, of which 1,400 were in the accident airplane make and model. The student pilot reported that he had accrued 20 total hours of flight time, 19 of which were in the accident airplane make and model. According to FAA and maintenance records, the airplane was manufactured in 1979. 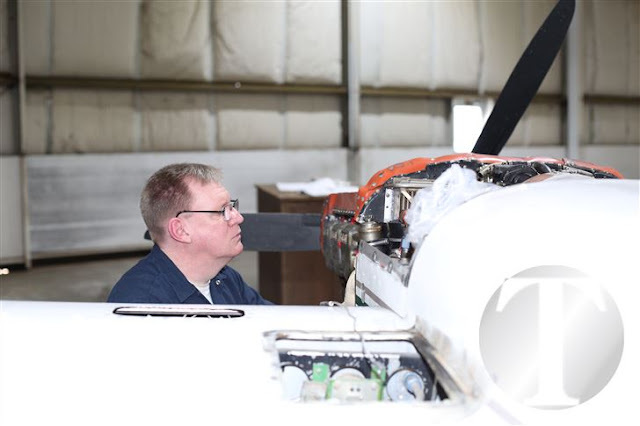 The airplane's most recent 100 hour inspection was completed on January 12, 2016. At the time of the accident, the airplane had accumulated 5,173.97 total hours of flight time.